Stress Free Lavender whisks away stress. Invigorating Grapefruit awakes your senses. Rejuvenating Ocean Breeze brings the sea to your soul. 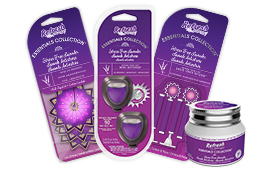 Let these scents refresh your senses in our Essentials Collection. 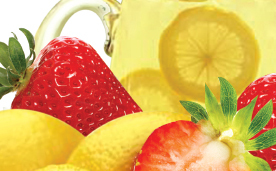 Fresh Strawberry/Cool Lemonade is a mixture of freshly picked strawberries and the tastiest lemonade in the world. This dynamic duo is the perfect scent combination of freshness, fruit and fun—guaranteed to brighten up even the longest of road trips. Battle even the toughest odors with a combination of performance and power! 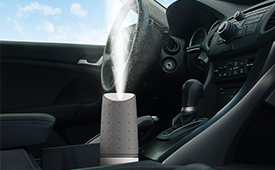 Keep odors at bay with the new Active Odor Eliminating sprays and foggers! behind a variety of fresh scents. It’s all so you can enjoy the ride. Every car owner has a story to tell about a messy car. Sonia is no exception. A fun day at the beach turned into a stench-filled nightmare. If only she had kept a canister of Refresh Your Car! wipes handy! Between having 5 vehicles at my house we definitely go through a lot of this product . I love getting into my car and it smelling great. Thanks Refresh! I just cleaned my car today with RYC and was so impressed! …got off grime that's been in my seats since forever! I'm sold!